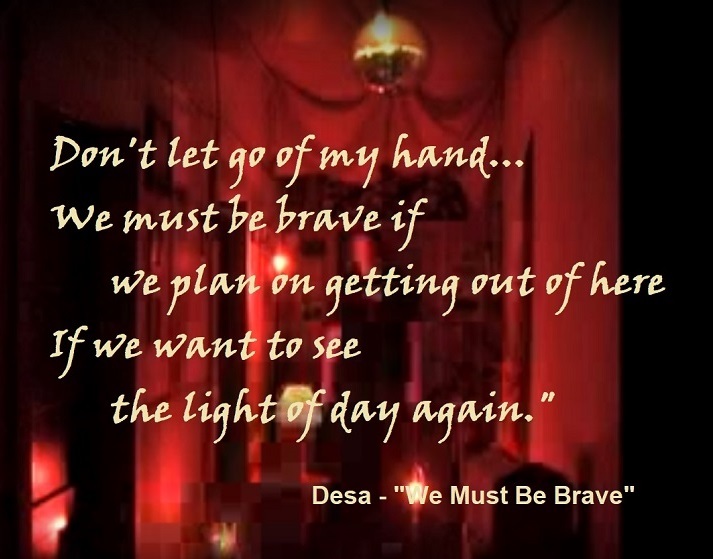 The voice above depicts being boxed in, needing to escape what is untenable. Who might these people be? Perhaps they are students, any of us at some time, focused on personal ups and downs, engaged or preoccupied, not anticipating some existential threat. Or teachers, concentrating every minute on students and learning, not dwelling on existential threats to classroom safety. Or ordinary people enjoying their most satisfying experiences, never imagining an inexplicable reversal of fortune from peace to trauma. The years of polite, logical dialogue seem to have persuaded no one toward a lasting solution to the crisis and national emergency of gun violence. All of us are trapped in this. Our best thinkers themselves escape out of a box by thinking out of the box. Let us imagine ourselves out of the confining box of gun violence and free to sing of aspirations and happiness, leaving behind no anguished voices trapped in some horrific and unnecessary circumstance such as portrayed in the lyrics above. 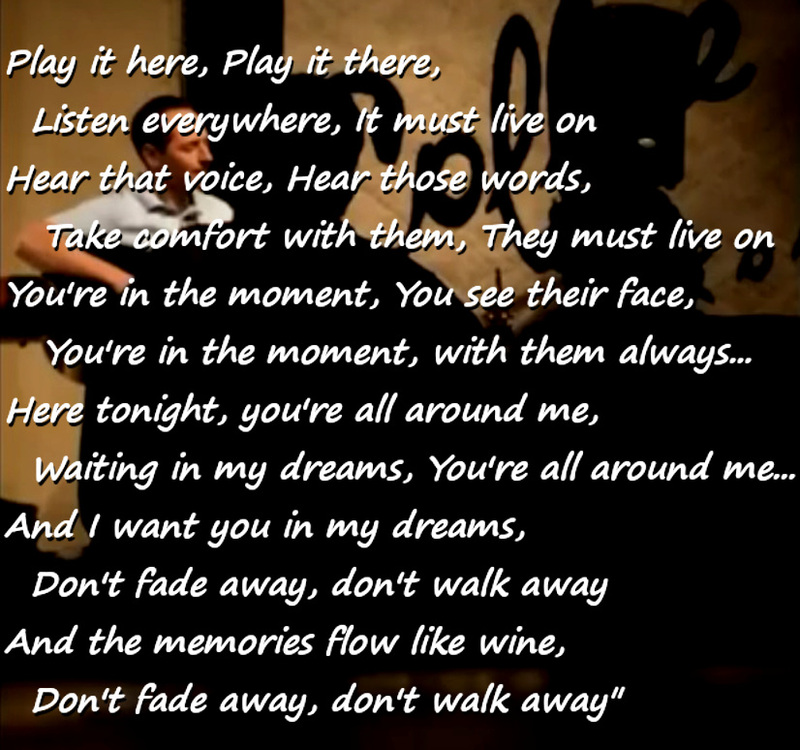 Until we reach that sublime time, we can find solace in remembering those near to us who we have lost in "The Song Must Live On" as captured in the lyrics and music below. Click here for a website that offers insights into using novel arguments including absurdity such as portrayed on the following pages, to help us deal with social challenges. Official text of Bipartisan Background Checks Act of 2019. The purpose of this Act is to utilize the current background checks process in the United States to ensure individuals prohibited from gun possession are not able to obtain firearms. This act amends Section 922 of title 18, United States Code which is also shown here. CNN online story on reintroduction in 2018-19 of 2017-18 legislation to ban most high-capacity gun magazines, technically known as large-capacity ammunition feeding devices (LCAFD). In the current session there are significant numbers of Senate and House co-sponsors. Click here for the Senate version of the bill from 2017-18 introduced by Sen. Bob Menendez which was never brought to the floor in either chamber of Congress. The advocacy group Protect Our Schools counts more than 40 partner organizations that have joined together for the purpose of urging action by individuals and leaders to end gun violence in schools and protect students. Protect Our Schools website includes a pledge to "make my voice heard by taking action to end gun violence in our schools and communities... no longer stand by silently while gun violence continues to threaten the safety of our students, schools and communities... demand that leaders take action to pass comprehensive laws to end gun violence NOW!" National Day of Action on April 20 to Protect Students Against Gun Violence. April 20 is the anniversary date of the shootings at Columbine High School in Colorado. The Day of Action is a response to failure to enact rational laws around the purchase of guns. Every child deserves to learn in a school that is safe. The time to act is now. 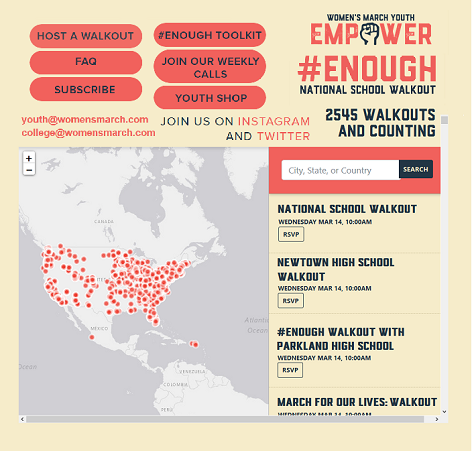 On Twitter, students have used the hashtags #NationalSchoolWalkout and #April20 and #April20Walkout. Sponsored by Network for Public Education along with affiliates NYSUT, the American Federation of Teachers and National Education Association. NEA Today newsletter on April 20 action. Protect Our Schools partners website including event finder and pledge. 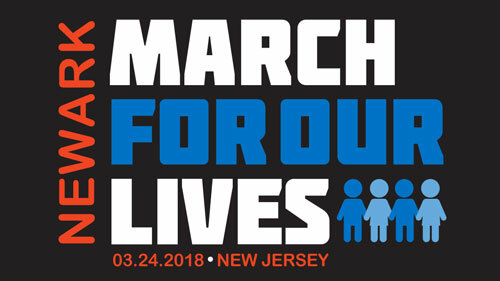 northjersey.com article: NJ students, teachers to join April 20 Day of Action Against Gun Violence. California Educator News article: April 20: National Day of Action Against Gun Violence in Schools. CNN: Marches, walkouts and sit-ins: Gun control battle heads to the street. From Washington Post: The 6 most memorable speeches at the March for Our Lives in D.C. 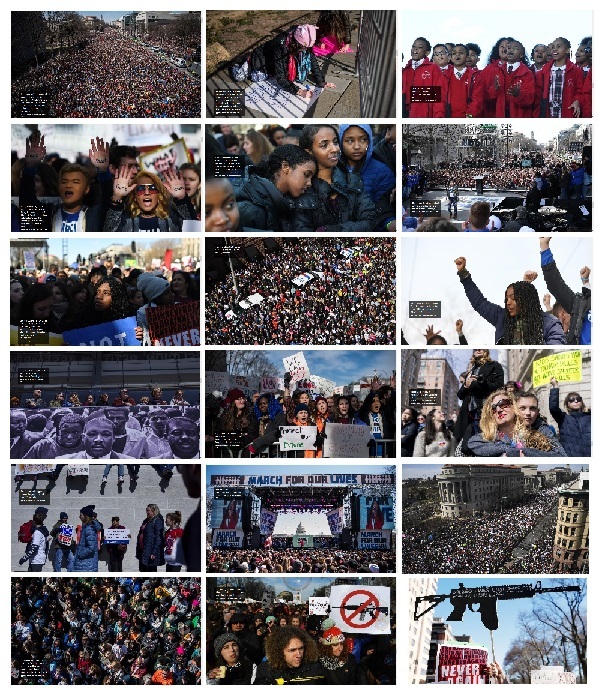 Hundreds of thousands of students participated in organized walkouts on March 14 at 10 am for 17 minutes to honor the 17 lives taken in the tragic shooting exactly one month before at Marjory Stoneman Douglas High School in Parkland, Florida... and also to raise their voices for action against all forms of gun violence. The March 14 action was organized by Womens March Youth EMPOWER, an initiative to provide young people with the tools needed to make a positive impact in their communities... to prepare young people with the skills and commitments to take actions around causes that matter to them with courage, compassion and collaboration. See Instagram and Twitter and Facebook. 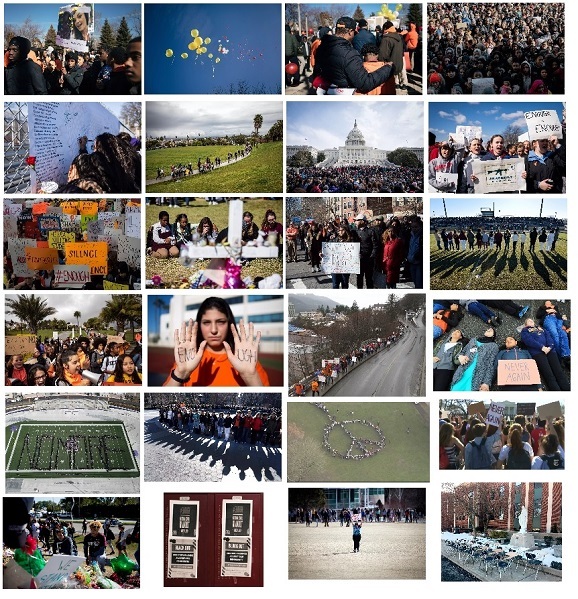 New York Times photo article on March 14 student walkout to honor the 17 lives taken in the tragic shooting exactly one month before at Marjory Stoneman Douglas High School in Parkland, Florida. "I Was a Marine. I Do Not Want a Gun in My Classroom." Giffords Law Center has more than two decades of experience fighting for the laws, policies, and programs proven to save lives from gun violence. Sandy Hook Promise is a national non-profit organization founded and led by several family members whose loved ones were killed at Sandy Hook Elementary School in Newtown, Connecticut on December 14, 2012. Sandy Hook Promise reports that 2.5 million educators, parents, community leaders and students have trained on Sandy Hook Promise programs and practices to protect children. Twitter feed @sandyhook embedded on home page. The Say Something Anonymous Reporting System launched by Sandy Hook Promise, lets students submit secure and anonymous safety concerns to identify at-risk individuals before they hurt themselves or others. Students can submit via a mobile app, a website, or a 24/7 crisis center. The mission of Connecticut Against Gun Violence is to identify, develop, and promote through the political process the passage of legislation designed to enhance gun safety at local, CT state, and national levels. Operation Ceasefire is problem-solving police strategy in Boston, Mass. that seeks to reduce gang violence, illegal gun possession, and gun violence in communities in Boston, Mass. and has achieved statistically significant results. See Huffington Post article which looks at Operation Ceasefire which is rooted in a law enforcement approach, and Cure Violence, a nonprofit based out of the University of Illinois, Chicago, which uses similar targeting techniques but uses a public health strategy. Cure Violence stops the spread of violence by using the methods and strategies associated with disease control, e.g. detecting and interrupting conflicts, identifying and treating the highest risk individuals, and changing social norms, resulting in reductions in violence of up to 70%. See YouTube video of founder Dr. Gary Slutkin at TEDMED. NIJ is the research, development and evaluation agency of the U.S. Department of Justice dedicated to improving knowledge and understanding of crime and justice issues through science. To reduce gun violence, NIJ promotes sustained, evidence-based programs that address weapons demand and supply. Link here to the report Promising Strategies to Reduce Gun Violence from the U.S. Department of Justice, Office of Juvenile Justice and Delinquency Prevention. OJJDP supports states, local communities, and tribal jurisdictions in their efforts to develop and implement effective programs for juveniles, so that contact with the justice system should be both just and beneficial to them. See 300 model programs and other information indexed on the left side of webpage. American Psychological Association commissioned an expert panel report summarizing research on gun violence risk factors and prevention programs nationwide to reduce the incidence of gun violence, whether by homicide, suicide or mass shootings. The full report appears on APA's website. Psychology Today article references two large analyses that provide insights on evidence-based methods for reducing gun violence. Following my attendance of the recent meeting at the middle school to discuss school shootings, I wanted to bring up two recommendations to you, which I would appreciate if you could discuss with the board. Is there one consistent anonymous mobile application that kids in all grade levels can use to submit tips for bullying along with any other kind of threats? I think this is vital in this day and age so kids don't feel like someone will know they reported something. And who will specifically monitor that app and the reported issues? How will trends be discussed in the classroom to keep an open dialogue and shared as one data point with police in a timely manner? Streamlining the available channels of communication for the public and our kids is vital. I think all schools need to officially survey the students via online survey, anonymously, to understand what THEY think needs improvement. The students are your clients and truly seeing how they all feel will help bring the best solutions to alleviate their concerns. My feeling from the recent meeting and hearing students speak, was that students need their feelings heard, shared and discussed openly during school, together with their teachers and administrators. Take a new survey every two months to see if their needs are being met. Grade yourselves - their feeling of being prepared and heard are #1! By taking this step you will be instilling and building trust with everyone on this topic and having meaningful, engaging dialogue that continues to mature everyone's readiness. I'm glad schools are going to test more on planning and response. That is without a doubt the best way to improve communication, identify gaps, improve readiness and build confidence and expectations for everyone that they know what to do. Thanks for listening and for all that you do to ensure the safety of our schools. One of the NRA founders was a New York Times reporter who, shortly after the Civil War, concluded that Union troops could have performed better if they had been more experienced using firearms. The NRA for most of its history focused on marksmanship and didn't mention the 2nd Amendment in publications. 2nd Amendment "right to bear arms" first became a political issue in the 1960's when Bobby Seale, Huey Newton and the Black Panthers successfully asserted this right by carrying loaded shotguns to the State House in Sacramento and on the streets in CA. Political opposition to the "right to bear arms" quickly developed in the 1960's with bipartisan support for gun control at state and federal levels. An insurgent group at the NRA's 1974 convention succeeded in electing new leadership and passing 15 new bylaws that prioritized lobbying by the NRA to protect gun ownership and right to bear arms based on the 2nd Amendment. The Supreme Court in 2008 for the first time decided a case dealing with the 2nd Amendment, District of Columbia v. Heller, with Heller petitioning to overturn DC's ban on owning handguns. The decision was in favor of Heller, with some caveats expressed in the Supreme Court's decision. He states "The only thing that stops a bad guy with a gun, is a good guy with a gun." Has he correctly scoped this out? 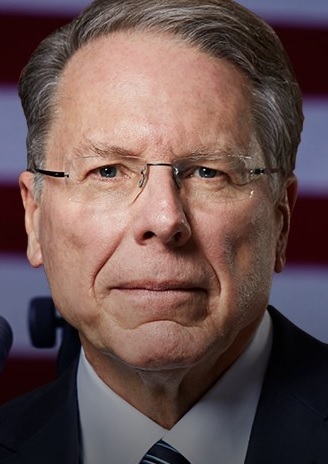 Is he tarnishing NRA's historic reputation as leading advocate of firearms training and safety? Hoppe's 9 or Rem won't fix this. And is he truly representing you? 73 to 81 million adult gun owners in the U.S.
Webmaster personal note: I learned firing range safety and target shooting starting when I was 13, and was co-captain of my New York City high school rifle team. Apparently I share with Supreme Court Justice Anthony Scalia the experience of carrying my rifle on a Queens subway to travel to a match. I also enjoy savoring the smoked venison shared by relatives who hunt. Please contact me with suggestions or comments. 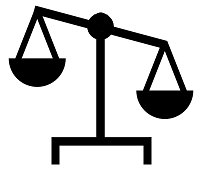 How much weight do you have on your side? The situation of non-law-abiding or anti-social individuals possessing and using guns to perpetrate unjust violence on others is universally considered unacceptable. Such violence endangers not only those on the front line of law enforcement, but reaches further to threaten many other members of society whose fundamental rights are infringed by such violence. Explanations for the high frequency of gun violence in America often mention the inevitability of "bad guys" or "disturbed individuals", particular loopholes in gun laws, inconsistent enforcement of existing gun laws, differing 2nd Amendment interpretations, and the protections afforded to individuals by an array of Constitutional rights. Socio-political progress to resolve many issues, including to truly ameliorate gun violence, requires compromises between individual rights and collective rights, with the goal to enhance general well-being. Compromises are already in place in our society, for instance to enhance motor vehicle and pedestrian safety on public shared roads. One of the NRA founders is reputed to be a New York Times reporter who, shortly after the Civil War, concluded that Union troops could have performed better if they had been more experienced using firearms. Historically, with little basic training and quickly-emerging security threats, the only way to guarantee America's military readiness was to not infringe on people's right to own and bear arms, with the assumption that people would train and practice on their own, and always have weapons at hand. Then people would be ready to participate in militias, which would consequently look more "regulated" or regular. This logic was enshrined in the 2nd Amendment. American politics has managed to avoid or backslide on gun control over recent decades, based on a narrow interpretation of the 2nd Amendment to protect guns and individual gun possession, as opposed to fitting into the overall task of securing America and Americans. Wrapping our flag around the 2nd Amendment has been effective at stifling discussion regarding the true security implications of millions of existing assault rifles, high-capacity magazines, etc. and their growing numbers. Even experts and rights advocates are ambivalent about stigmatizing those who have exhibited signs of mental illness or instability. Mental health professionals stake their careers on the possibility of bringing challenged people back into a happy, successful, socially acceptable mainstream, which may include possessing guns. Mental health is a soft, less-than-determinant science, so gun control based on mental health diagnosis will likely be difficult to sustain through the potential challenges. Factors of gun possession or mental health cannot be shown to consistently anticipate or predict actual acts of gun violence. Without a cause-and-effect link, how can tighter gun control laws and mental-health-based constraints on gun possession possibly be demonstrated to consistently keep us safe, and thereby be justified? Are the 1st Amendment (uninfringed free exercise of religion, speech, press, assembly, and petition) and the 2nd Amendment (right to keep and bear arms) inextricably linked to protect and defend Americans and their values? What is the most practical course of action to reduce the risk and impact of mass shootings? In what way can each of us contribute to the debate over keeping us safe at schools, churches, events and other public venues? What can society engineer that could gain wide public understanding, support and funding? Clouds of frustration and disappointment have sidelined the technology known as "smart gun" which describes a weapon that only the gun's owner can shoot. Smart gun relies on controls that authenticate the person who holds the weapon as its owner before enabling its discharge. A smart gun records for reference in its memory the owner's fingerprints and the owner's characteristic physical handling of the smart gun. When someone tries to discharge a smart gun, the device's sensors detect precise biometric details from the person currently holding the weapon, such as fingerprints, the shape of the person's hand, and how the hand functions as the weapon is held and the hand goes through motions such as sqeezing the trigger. The smart gun then analyzes the distinctive biometrics of the person currently holding the gun, and compares these to stored reference biometrics for the gun owner. The smart gun then decides to allow or not allow the weapon to discharge. Vast base of existing weapons owned by Americans cannot or likely would not be retrofitted with smart gun technology. Will the cloud of frustration and disappointment that sidelined smart gun also block our vision to pursue possibly more successful concepts to keep us safe from gun violence, particularly mass shootings at schools, churches, events and other public venues? The Cold War is a historic standoff between superpowers US and Russia, with each investing vast sums for decades to build and maintain abundant and opposing nuclear offensive capabilities that guarantee mutually assured destruction (MAD). 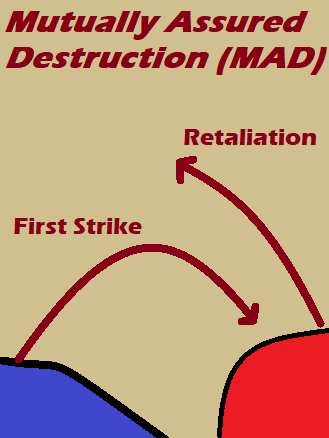 If either side initiates a first strike, then the other retaliates, with near-complete destruction suffered by both sides that makes initiating a first strike unthinkable. America alternatively has considered the strategic defense initiative (SDI) of antiballistic missiles to shoot down first-strike missiles. The effectiveness of this approach is questionable against today's state-of-the-art offensive weapon-delivering missiles with their constantly improving propulsion, control, stealth and countermeasure strategies. By contrast, while hand-held firearms are quicker-shooting and more powerful today, these conventional weapons have not changed in most fundamental ways since their invention many centuries ago. State-of-the-art sensing technology and digital processing should be able to easily, cheaply, and quickly identify and pinpoint the source of conventional firearms discharge, and immediately report the exact location to authorities. Similarly, there are multiple technology-based possibilities for how to respond effectively to directly and successfully confront the situation of an imminent mass shooting using a device that disables both the firearm and the shooter. Can safety from gun violence at schools, churches, events and other public venues be relegated to the status of a Cold War? Will a perpetrator realize the futility of initiating a strike, because MAD totally subverts the mass shooter's goals by vastly reducing or eliminating the impact? Can a system of detection, reporting and response demonstrate a MAD outcome consistently and regularly, thereby encouraging a Cold War-style standoff but with the difference that the outcome is heavily tilted or biased to minimize a shooter's impact? Can particular demonstrated methods to confront the situation of an imminent mass shooting be strongly and publicly supported by all elements of society including science, engineering, law, politicians and stakeholders? Ultimately will the goal be met to dissuade a perpetrator before a tragic event is ever planned, based on the futility for a shooter of getting into a MAD scenario where the outcome is not only assured but tilted against the perpetrator? Whether or not advanced technological solutions are implemented, the MAD concept for dealing with gun violence and mass shootings will require an increased investment in several branches of the sciences as well as engineering. "...unsure whether the blasts were coming from outside or inside...maybe it was a sniper...could be firecrackers...then the fire alarm...don't have any description yet...separate radio system...if I'd just heard more shots...if I knew where he was...it was all so fast..."
What would be required for American society to succeed in directly confronting and countering the firepower of a mass shooter using technology? Can science and technology actually help reduce gun violence, even as weapons such as the semi-automatic weapons used by mass shooters are advanced with new materials, greater functionality, and lower cost? Can we see through the past promises, such as smart guns, that took us into clouds of frustration and disappointment? Do we have what it takes to seek out and explore reasonable risks to reach a clear future of practical, or at least possible solutions? How can we use science and technology to complement socio-political strategies of much tighter gun control laws and much stronger mental health-based constraints on gun possession which, alone, probably cannot consistently keep us safe? How can we use science and technology to enhance the value of adding armed guards and arming some teachers in schools, by improving logistics so that these protections are more adequate and cannot easily be evaded? Detect using state-of-the-art acoustic and visual sensors and digital processing technology to identify and pinpoint the source of a firearms presence or discharge. The high-tech sensors and associated processing and analysis tools would likely incorporate AI machine learning, so must be able to unambiguously distinguish a normal baseline of activity from a mass shooting or other violent event. a biometric database including information on visual appearance, face, retina scan, voice and touch to continually authenticate individuals at the location. This database could be generated in advance and stored as a reference, or created just-in-time, non-disruptively, at the initial authentication point at an event. Report immediately to authorities the location of gun violence, using readily available communications technology such as data networks and smartphone app that immediately provide essential information to an armed guard situated near the location, or to a firearm-and-shooter-disabling device. Respond to directly confront and counter the firepower of a mass shooter, after interpreting the complex statistics of a positive detection, and applying strategies determined by experts and local authorities that reflect the particular venue. See more details on response strategies in the next menu tab. There should be integration of security with other activities, bringing together authentication, authorization, admission, attendance-taking, control of movement, access control, polling, assessment, and other logistics. Linking together the available monitoring sensors and physical response actuators into a single system would allow sharing resources that should boost overall efficiency and effectiveness. What would be required to successfully detect and report needed information, which is required prior to responding directly to confront and counter the firepower of a mass shooter? An increased investment would be required in several branches of science and engineering to generate developments in diagnostic sensing and advanced processing, possibly including quantum computing. Business and industry must be encouraged by policies and funding to commit resources and reputations to developing and applying technology as a tool to directly confront and counter the gun violence of mass shootings. A high level of success must be achieved. Methods must be strongly and publicly supported by all elements of society including science, engineering, law, politicians and stakeholders. Ultimately the goal would be to dissuade a perpetrator before a tragic event is ever planned, based on the futility for a shooter of getting into a MAD scenario where the outcome is not only assured but tilted against the perpetrator. courtesy of NASA.gov website, showing that balanced forces yield zero net force. Response is sufficiently advanced so that the outcome is heavily tilted or biased to minimize a shooter's impact. Response should leverage the fact that while firearms are quicker-shooting and more powerful today, firearms have not changed in most fundamental ways since their invention many centuries ago. There are multiple possibilities using focused light, concussive sound, air cannon, chemicals, magnetics, taser and other non-lethal weaponry to effectively disable a perpetrator. The choice of how to respond to the complex statistics of a positive detection most likely will be left to experts and local authorities, and also will depend on the particular venue and the resources that are available and can be applied. Advocating for these technological solutions should not be conflated with failed futuristic SDI or smart gun experiments. Concepts described above to protect against gun violence do not place blind faith in technology, but rather are built on prior decades, even centuries, of research and development in many areas of science and engineering. When considering technological solutions, consider that some observers are skeptical about more socio-political and peripheral strategies of gun control and mental health policy, which don't seem politically feasible at this moment, and alone probably will not consistently demonstrate effectiveness in keeping us safe at schools, churches, events and other public venues. Similarly, adding armed guards and arming some teachers in schools is rapidly becoming the universal practice, but by itself this practice alone may provide inadequate inadequate protection, and might easily be evaded. A more reliable evolutionary path to improved safety from gun violence may be to directly confront and counter the firepower of a mass shooter with a universal robotic firearm-and-shooter-disabling device. Such technology would be most effective when it is part of a systems approach at the involved schools, churches, events and other public venues. Combining security and other logistics tasks (i.e. authentication, authorization, admission, attendance-taking, control of movement, access control, polling, assessment) into a single unified system with shared resources can boost the overall efficiency of the detection process. 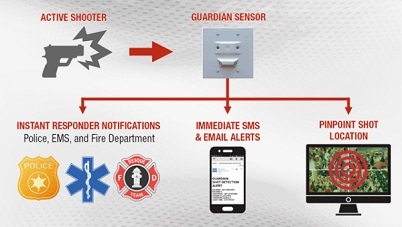 Front-ended with a robust detection process, the custom-designed response mechanism can be deployed with reduced risk and increased effectiveness. What would be required for American society to succeed in directly responding to confront and counter the firepower of a mass shooter? Detection and reporting information must be appropriately communicated to responders (see prior detect and report tab). Human responders must be trained and provided with sufficient communications and other tools to respond. Robotic firearm-and-shooter-disabling devices may need to be created and customized for each situation, and coordinated with human responders. An increased investment would be required in several branches of science and engineering for research and development into improved tools and methods. Business and industry must be encouraged by public policies and funding to commit their resources and reputations to developing and applying technologies and other methods to directly and effectively confront and counter mass shootings and other gun violence. A high level of probable success must be demonstrated. tells entire Secret Service "You're fired!" guarantee "duel discounts" to drivers who, after a collision, resolve a claim "on the spot"
supply stickers that must be attached near the sight and trigger of drivers' guns that say "I'm not driving now"
incentives to print out your documents and carry them around concealed in a coat, or at least saying so, like "I have the evidence." portraying "lots of fantastic new weapons to keep us safe." travel-cost-saving measure for high school athletics that adds artillery competition between neighboring schools where both teams can stay "home"
manufacturer introduces new "taser flavor" varieties, with "tickle", "arouse", "sleep", "laugh", "tweet", "wired" and others.